When I started this blog I didn't have a Helmer, all my polish was in boxes and I was soooo excited when I got my first one, shamefully to say as soon as it was built it was already full to the brim, so Helmer number two arrived and that too got filled up and I soon needed Helmer number three. I put off getting my third Helmer as I wasn't really sure where I was going to put it and I thought there's no rush, the Helmer will be around for ages yet, but the other week when I finally caved and decided I really needed to get one and make room for it I found that there wasn't any being sold at my local store. I have red Helmers and I can't handle the thought of having other colours, I want them to all be the same, so I was a bit concerned when the red one was showing as only being sold at a few stores in the UK. So to cut a long story short I went into my local store and asked if they were getting any more in, they weren't 100% sure but thought the red one's being discontinued as there only seemed to be limited stock left throughout the UK. So, if like me you have your stash in red Helmers and plan on getting more get them now, as I don't think they'll be around for much longer. The image above from Ikeas website shows what they think Helmers might be used for, we all know different though and I'd love to see them mention on their site that it's the number one storage solution for nail polish junkies. Anyway, I hope that if you do need a red Hemler you get one, and you never know, we might be lucky and it could be that they're just having production problems and red Helmers will be back in all stores soon. 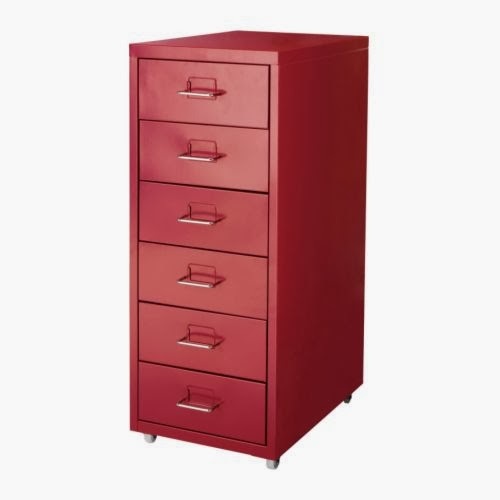 If you want to check if your store is one with red Helmer left you can check on Ikeas website, search for Helmer, pick your colour and then on the right hand side of the page you can check stock availability for your store. PS - your background for your blog is rockin!